Backed with diligent team of professionals, we are best in offering Vertical Coil Tong at affordable rates. - 1"C" hook capacity up to 40000 Kg. - Vertical coil tong capacity up to 30000 Kg. Coil up ender, down ender with troll y or with out trolley capacity up to 30000 Kg. - Transfer trolley with spring loaded or without spring loaded capacity up to 100 ton capacities. - We can also manufacturer equipment as par your Drawing. These fixtures facilitate the lifting of coil from the vertical winding or upending machines as well as general handling during transformer assembly. The four motorized arms of the fixture provide high lifting capacity and ensure even loading to prevent any damage to the coil. Coil weight from 10 to 35 t Steel, aluminum sheet coil with width from 600 to 2200 mm & OD up to 2600mm Automatic back movement of arms to protect coil edges from damage during movement. Being a prominent company, we are involved in providing a wide array of Double Rim Coil Tong. Our provided array is designed and developed with a chief quality metal and is made to remain completely reliable even in the harshest surroundings. This Coil Lifter is used for ensuring flexibility while loading coils on decoilers. Being an esteemed organization, we are readily engaged in providing a superb quality assortment of Coil Lifter. 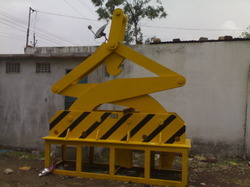 Our range comprises Coil Lifting Tongs, which find application in the construction and material handling industries. The tongs we offer are well accepted in the domestic market and well received throughout the industry. Engineered with precision, these lifting equipment are well known for load bearing capacity and sturdy construction. We have marked a distinct and dynamic position in the market by providing a high quality array of C Hook Coil Lifter. We are also involved in Steel Trading & Profile for Various Sectors for Domestic and International Market.